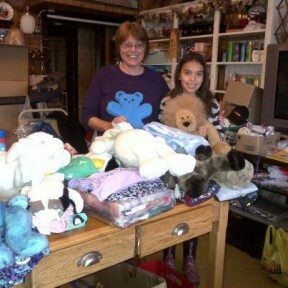 I would like to share with you how a 9-year-old girl paid it forward to help other children in our community. Nyah Stables turned 9 on November 23rd and for her birthday party, Nyah asked her friends to donate pyjamas and stuffed toys to help Power of HOPE instead of receiving presents for herself. One Saturday in December, Nyah and her mother came to my house with a donation of 17 pairs of pyjamas, 35 stuffed toys and other items. Nyah carefully went through the pyjamas and matched a toy with each pair. I must tell you the smile on her face would have melted your heart; knowing what she was doing for other children in her community. I cannot put into words how this little girl has touched my heart. Nyah will be back in 2013 to help Power of HOPE along with another donation from her birthday party.